Tiffany's Online Finds and Deals: Check out this fun looking bow training set! Check out this fun looking bow training set! This Majik Accurate Aim 3-in-1 Bow Hunting Trainer with 3 Targets looks like lots of fun! It comes with bow and arrows and target. With bow season coming up, this would be a fun game to get! The Majik Accurate Aim 3-in-1 Bow Hunting Trainer brings the wild of the outdoors into your home! 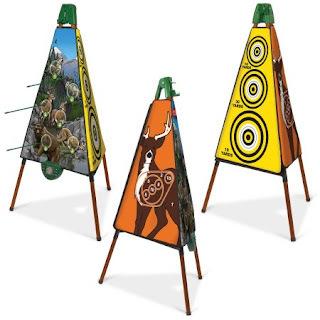 Choose from three different target training options including Electronic Bow Hunt, Archery Practice and Field Hunt. With automatic LCD electronic scoring and wildlife sound effects, watch your points rack up and hear the call of the wild. Have your hunting adventure come alive with family and friends with the Majik Accurate Aim 3-in-1 Bow Hunting Trainer! Like Bowling? Check out this bowling game!